V.I.P. Suites are renovated independent apartments. They are elegantly furnished with Aegean antiques, fully equipped kitchenettes, beautiful living rooms and stunning bedrooms. 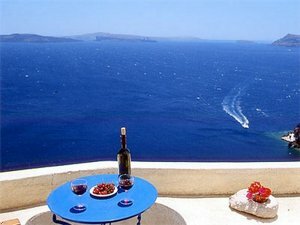 You will be amazed at the world famous Oia sunset and the panoramic views of the volcanic islands. Full refund of deposit less 5pct or 15 USD processing fee, whichever is greater, if reservation is cancelled in accordance with the hotels cancellation policy. In addition guest will pay 50pct for any unused days or early departures.